Welcome to Day 4! Long title, huh? In this section, we will create two helper classes for our GameScreen, so that we can start implementing our gameplay. Then we will add an orthographic camera and add some shapes to our game! 1. Whenever I say open a class or create a new package, I will be asking you to modify the ZombieBird project. 2. If I ask you to run your code, you will open your ZombieBird-desktop project and run Main.java. 3. When we add assets (images and sounds), we will add to the ZombieBird-android project. All other projects will receive a copy of the assets that are in this project. The float delta is the number of seconds (usually a small fraction) that has passed since the last time that the render method was called. When I asked you to print 1/delta, I was asking you to print out how many times that the render method would be called in one second if that rate was sustained. This is equivalent to our FPS. Firstly, we will update all our game objects. Secondly, we will render those game objects. 2. Updating the game objects should be the responsibility of a helper class. 3. Rendering these game objects should be the responsibility of another helper class. Alright! We need two helper classes. We will give these helper classes some descriptive names: GameWorld and GameRenderer. 1. 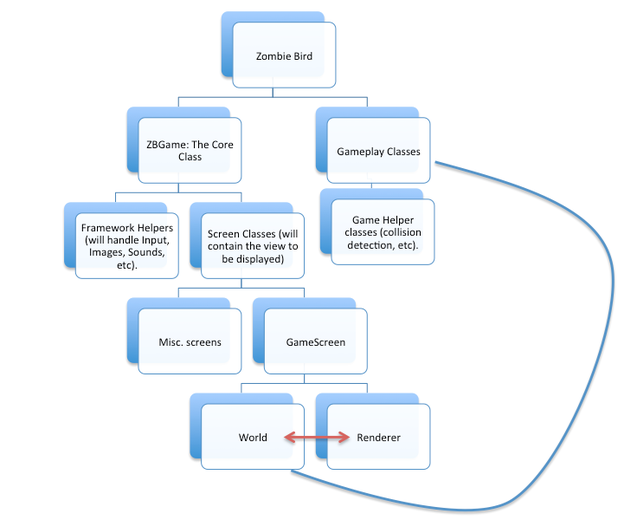 When GameScreen is created, we must create a new GameWorld object and a new GameRenderer object. 2. 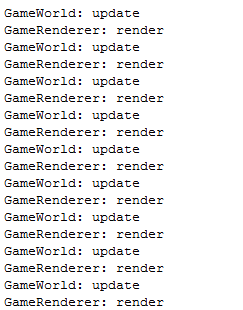 Inside the render method of the GameScreen class, we must ask our GameWorld object and the GameRenderer object to update and render. I will ask you to make these changes yourself. If you get stuck, scroll down. The whole point of having the GameWorld and GameRenderer classes is so that our GameScreen doesn't have to do the updating and rendering itself. It can simply ask two other classes to do those tasks. // We are passing in delta to our update method so that we can perform frame-rate independent movement. Try running your code (Main.java in Desktop project). Warning: your game may flicker (we are not drawing anything). This will give us an error, as the GameRenderer class does not have a constructor that takes in one input of type GameWorld. So we will create this. Open up the GameRenderer class. We need to store world as a variable inside our GameRenderer, so that whenever we want to refer to an object inside our GameWorld, we can retrieve it. - Inside the constructor, initialize this variable with the GameWorld object received from GameScreen. Step away from the code for a minute. Spend some time making sure that you understand what we have just done. Look over your code and make sure you can see the 3-way relationship of the three classes we have dealt with. By this point, my hope is that you understand the roles of the GameScreen, GameWorld and GameRenderer, and how they work together. We will do one more thing in this lesson to illustrate how we would go about creating GameObjects and implementing them in the game. Before we do that, we are going to talk about the Orthographic Camera. libGDX is a 3D game development framework; however, our game will be in 2D. So what does this mean for us? Nothing really, because we can make use of something called the orthographic camera. A lot of "2D" games that you see are actually built in 3D. Many modern platformers (even those that employ pixel art) are rendered by a 3D engine, on which developers create scenes in 3D space, rather than in 2D. For example, have a look at this fan-made Mario game to the left, in which the world has been reconstructed using 3D models. Looking at Mario 2.5D above, it is clear that the game is in 3D. The characters have "depth." Why does this happen? Because in a 3D environment (look around you), objects that are farther away appear smaller to the viewer. Even though we are looking at Mario from a perpendicular angle, some objects in this 3D world, such as the bricks, will appear smaller than those that are closer to us (the camera). This where an orthographic camera comes in. When we use an orthographic projection, all objects in your scene, regardless of their distance, are projected onto a single plane. Imagine taking a big canvas and pushing it through the scene of the game in the second image above. When each object hits the canvas, it will be a flat, fixed-sized image. This is what an orthographic camera provides for us, and this is how we can create a 2D game in 3D space. Using an orthographic camera, we can project 3D objects into a single viewable plane. I hope I'm not scaring you with all this talk of 3D space and camera projections. It is much simpler in code than I am making it seem. So let's implement this into our game. Open up GameRenderer. We are going to create a new Orthographic Camera object. The three arguments are asking: 1. whether you want an Orthographic projection (we do), 2. what the width should be and 3. what the height should be. This is the size of our game world. We will make changes to this at a later time. This is simply for illustration. 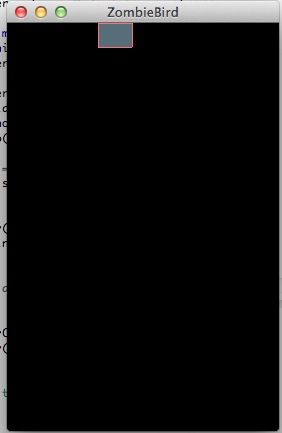 Remember that we set our screen resolution in DesktopLauncher.java to 272 x 408. This means that everything in our game will scale by a factor of 2x when drawn. To test our camera, we are going to create a ShapeRenderer object, which will draw shapes and lines for us. This is provided by libGDX! Now that our ShapeRenderer is ready, we need to create something for it to render! We could create a rectangle object inside our GameRenderer, but that violates our design pattern. We need to create all Game Objects inside our GameWorld and retrieve it in GameRenderer to draw it. We have created a new Rectangle called rect and provided the import: import.com.badlogic.gdx.math.Rectangle. Notice that we do not use the Java Rectangle here as that is not available in some platforms. (the implementation for gdx.math.Rectangle uses the correct Rectangle based on the platform). To make this private Rectangle accessible to anyone who has a reference to a GameWorld object, we create a getter method (great reasons on why we use these here). We then added some code that will allow our rectangle to scroll to the right (and reset at the left)! Now that our Rectangle is ready, let's go back to the GameRenderer. I have separated the method into three main sections. Please read the comments to see what is happening. * 1. We draw a black background. This prevents flickering. // We MUST do this every time. No errors? Great! You should see something like this! Spend some time experimenting with this code. If you can draw shapes, you can draw images, which we will do very soon. I know progress has been slow so far, but things should start picking up now that we have our basic GameScreen structure ready! Join me in Day 5, and please like us on Facebook using the button below!